Packed into a little square bottle most commonly found on table tops at ramen places, this Japanese spice blend has started popping up in restaurants everywhere. It complements a wide array of foods, and has its roots in Chinese herbal medicine. A good bowl of ramen seems unimprovable if not for the discreet, red-topped bottle often sitting beside it. Shake the jar and out falls an array of seasonings that brightens and heats simultaneously. This is shichimi togarashi, and it’s making its way from the ramen counter to the spice rack of fine-dining kitchens, stretching beyond noodle soups and rice to cured cactus and fried chicken. Shichimi togarashi is decidedly Japanese, but its roots are in Chinese herbal medicine. Each of its seven ingredients (“shichi” means “seven” and “mi” means “taste”; “togarashi” is Japanese dried red chile) brings a distinct flavor profile and herbal benefit to the colorful blend. A traditional recipe mixes togarashi with sansho (lemony Sichuan peppercorns that make your tongue tingle), dried orange or tangerine peels, dried seawood (nori), sesame seeds, hemp seeds, and garlic. Some blends may swap in dried ginger, yuzu peel, or poppy seeds. The blend is commonly referred to simply as togarashi in the U.S. Still, to avoid confusion with ichimi togarashi (“ichi” meaning “one,” so “one-taste pepper”), which is merely ground red chile pepper, you should call it shichimi. “The herbal medicine idea was taken by the Japanese-not as largely practiced as in China-but it’s the idea of something being good for your health,” says Hiroko Shimbo, an authority on Japanese cuisine and author of several books, including Hiroko’s American Kitchen (Andrews McMeel Publishing, 2012, $22). That citrus, fruity hit makes it a perfect foil for seafood, too. “It’s one of those things that really enhances an oyster,” says chef de cuisine Robert Hernandez of San Francisco’s cozy Octavia, where he first started sprinkling it atop bivalves four years ago. “It’s my favorite trifecta of seasonings: citrus, chilis, and salt. The addition of nori and sesame seeds make it really crave-able,” says chef Attila Bollock of Barton G., in Los Angeles. “I could put it on just about anything.” The restaurant’s popular version of deviled eggs features white truffle whipped egg yolk topped with a shichimi bacon crumble, crisp garlic, and fresh, black truffles. While traditionalists may frown upon seeing the blend topping anything beyond udon and miso soup, chefs are notorious for plucking curious finds from their travels and incorporating them into dishes. 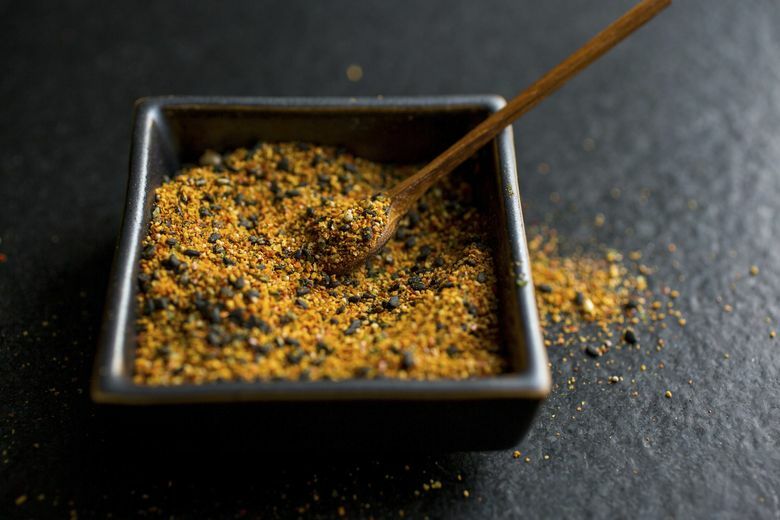 As a ripple-down effect-from chefs to big brands to consumers-it’s easy to see what’s driving shichimi’s expanded use. Look at any trend forecast these days, and topping the list is global spices. The Institute of Food Technologists noted that “consumers are developing an appetite for new and exciting ethnic flavors” in its predictions for hot food trends of 2018. But before it can hit the supermarket on a bag of Lay’s potato chips, it first has to be seen on menus. At the Heritage, a seasonal American restaurant in Forest Park, Illinois, chef Michael Spiewak makes a confit pork belly with braised escarole and shichimi hollandaise for an epic Eggs Benedict. The star, apart from the rich pork belly cooked slowly in olive oil and citrus for 12 hours, is the spice blend that hits your palette first and remains with you at the end. There’s a wealth of great Japanese restaurants in New York, which is where chef Jamie Young, of Sunday in Brooklyn, got his inspiration. “I became really excited about the spice blend and how we could make it our own but still stylistically keep it similar to its traditional self,” he emailed. To make a truly original fried chicken, Young took leftover fermented chili pulp from their house-made hot sauce and added the bar’s spent citrus peel, burnt coriander, bay leaf, and sea lettuce. “It tasted great with a wonderful depth of flavor, similar to togarashi, but it was our own unique blend,” he wrote. The spice blend has even been adopted by creative bartenders. At Hunky Dory in Brooklyn, New York’s Crown Heights, bartender/owner Clair Sprouse wanted to make a truly seasonally inspired Bloody Mary. Her first step: Remove the canned tomato juice from the equation and replace it with carrot juice. “I wanted to rim the drink with a blend of spices that would capitalize on that savory but slightly sweet element, provide spice and warmth, and add a new layer of aromatics to the finished drink. Togarashi brings all of those things to the glass,” says Sprouse, who utilizes bar waste-spent citrus peels and leftover fennel seeds-in the final product. If you’re looking to try your hand at it, cookbook author Shimbo has one piece of advice: Find it fresh. Whenever she travels to Tokyo, she picks up her own custom batch at Yagenbori in the Asakusa district, where they whip up unique versions for each visitor based on their preferences-heat being a key to its endless permutations. Shimbo likes it spicier. “I just cannot buy a little bottle over here. It is so stale,” she says of store-bought brands. If you don’t find yourself in Tokyo, or have the wherewithal to make your own blend, chef/owner Patrick Connolly of Rider in Brooklyn has an additional recommendation: the shichimi togarashi blend from Manhattan’s famed Kalustyan’s (also available online from global bazaar SnukFoods). He uses it in a coating for fried eggplant, adding cayenne, paprika, garlic powder, and brown sugar to a shichimi base.